Earn 4499 towards your next purchase with MyRewards. NOTE: The release date for the Pro version is December 1. Once you place an order for the FLIR Vue PRO Thermal Camera it will take up to 5 business days to ship from our warehouse in San Diego. The new Vue Pro R from FLIR gives both drone operators and certified thermographers the power to gather accurate, non-contact temperature measurements from an aerial perspective. Every still image the Vue Pro R saves contains accurate, calibrated temperature data embedded in every pixel, adding even more value to your sUAS operations and services than ever. Keeping the same industry-leading thermal imaging quality, interfaces, and capability as the best-selling Vue Pro, the Vue Pro R adds fully radiometric data-gathering to sUAS applications as diverse as building and roof inspections, power grid inspections, infrastructure analysis, precision agriculture, and public safety. The Vue Pro R is more than a thermal imager-it captures accurate, non-contact temperature measurements from an aerial perspective and saves images with calibrated temperature data embedded in every pixel. Vue Pro R captures regular JPEGs and fully radiometric R-JPEGs that can be fully analyzed in FLIR Tools thermography analysis and reporting software. 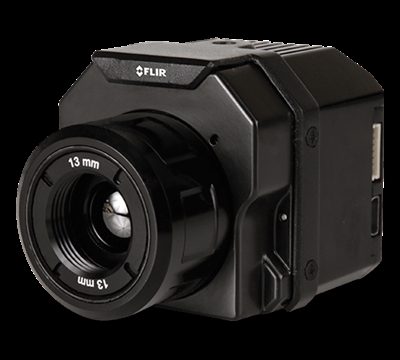 It also records 8-bit digital video in MJPEG or H.264 formats, and 14-bit TIFFs right on the camera so you won't lose any of your data to transmission loss. Imagery is saved to the micro-SD card and can be retrieved either directly from the card or by plugging the camera into a USB cable, where your computer will see it as a storage device. Like Vue Pro, Vue Pro R's Accessory Port connection gives you access to MAVLink commands camera controls over PWM commands, so you can select color palettes, start and stop recording, or trigger the camera's e-zoom in-flight from your radio controller. If MAVLink is enabled, two camera controls are available; without MAVLink you can control up to four camera controls. Vue Pro R comes with a built-in, low-power Bluetooth module, so you can easily configure your camera with our custom iOS or Android apps before you take off. Change color palettes, set your image optimization features, configure your PWM inputs, and start recording all without lugging a computer to the field.